Place the softened butter, xylitol, baking powder, xanthan gum, and sea salt in a mixing bowl and cream together with a hand or stand mixer until light and fluffy. Add the vanilla, almond milk, and egg, and mix well until completely combined. In a separate bowl place the almond flour (ground almonds), coconut flour, and konjac flour and mix well. Add half of the flours into the butter mixture with the mixer, then add the rest of the flour with a spatula until it is completely incorporated into a dough. Wrap the dough in plastic wrap or place in a ziplock bag and put in the ‘fridge for at least two hours to become firm. Take the dough out of the ‘fridge and carefully roll out to 1/8′ – 1/4’ thick using a little almond flour to stop it sticking to the work surface or the rolling pin. Use the cutter of your choice to cut out the dough. I used a 2″ round plain cutter. Place the cookies on a baking sheet 1″ apart. Bake in the center of the oven at 350F for 10 – 12 minutes – until they are barely starting to brown a little. Remove from the oven and leave on the tray until the cookies have firmed up enough to move without breaking or getting mis-shapen. 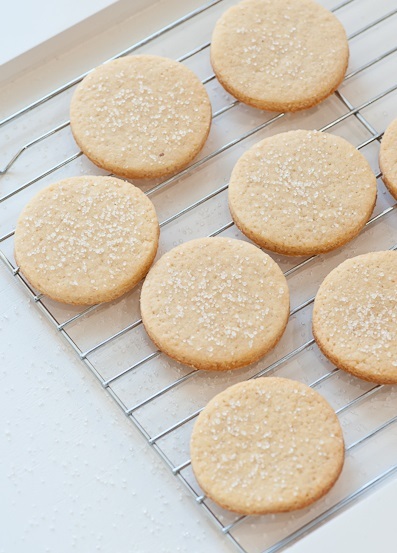 Optional: To get the sugar effect pictured, sprinkle the cookies with extra xylitol after they have cooled.